No matter who you are, trying to duplicate an experiment exactly can be a near-impossible task. Unless the documentation is spot on, and even then, there might be a few variables that keep all that science from working out. That is especially true if you're talking about reaching through reality into a parallel dimension and trying to... well, we're never really sure what those science guys are trying to do when they're meddling with the Upside-Down. Of course, if you're trying to figure that out, you still need every detail right! We're assuming you've got everything else prepared from the powerful psychic energy to the countless pounds of salt for the sensory deprivation tank. But, did you think about the socks? Probably didn't think that Eleven's pair of 80s style knee-high socks from Stranger Things was an important component, but you bet they are! Who knows why this pair of Eleven's Socks has such a critical importance to the success of your Stranger Things experiences? 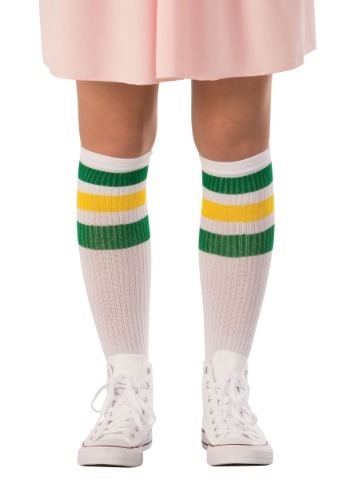 All we know for sure is that there is something about the cosmic balance of white, green, and yellow in these socks that will keep the horrors of the other side from freaking out. Because... psychic something. Reasons!